On Tuesday, we considered the remaining rule changes, which originally will have been passed by their proposing CLPs in 2017, over 18 months ago. This article summarises the debate, looking at rule changes designed to improve the auto-exclusion process and to allow CLPs to ask for permission not to run a candidate. It should be noted that rule changes to remove the “contemporary” constraint on motions at conference and to ensure that CLP rule changes re debated at the conference following their submission were passed. Two rule changes proposed changes to Rule 2.I.4.B, the rule under which many members have been expelled/auto-excluded, two rule changes on the Deputy Leadership, (one proposing a 2nd Deputy, who must be female), a rule proposing Conference Standing orders, a rule proposing the abolition of the one year waiting period for CLP rule changes, a rule change proposing that motions need not be contemporary and a rule change proposing that CLPs could ask the NEC for permission not to run a candidate in parliamentary elections. The final rule change proposed was to change back from small, councillor dominated Local Campaign Forum’s to broader and more representative Local Government Committees; this is an issue that the NEC want’s to think about and recommended remission, which is what the CLP did. The NEC makes recommendations on what to do, i.e. for, against or remit and rarely loses. The same was the case today. Our delegation voted with the NEC with one exception, which was the first. The rule change proposing a change to Rule 4.I.2.B proposed changes in two way. Firstly it proposed qualifying the type of organisation that might lead to expulsion as one that conflicted with Labour’s aims and values and secondly, placed the process by which such exclusion would be undertaken under auspices of the disciplinary process. (I have written a lot on the weaknesses of the Party’s disciplinary processes much of this in this blog.) The current rule allows a secret decision and no appeal. The disciplinary process is marginally more visible than that. We have debated these rules and exclusions in our CLP and believe them to be factionally motivated and contrary to the rules of natural justice. Interestingly the CLP had allowed the rule change to be called, “Membership of other parties” which isn’t what the rule is about; it’s current words make “support for organisations other than official Labour organisations” an act that renders one liable for exclusion. This rule is usually used against small groups in the party which leads one to ask, why not Progress, Labour First or Momentum. It was also used against three long term activists in NW Surrey who had wanted to explore running a “progressive alliance” candidate against Jeremy Hunt. It was also used against Moishe Machover although the decision was revoked as it was considered that writing an article for a newspaper couldn’t be considered “support for an organisation other than …”. This shows one of the problems with the rule; there is no certainty. I note that if a Councillor or an MP and you wish to “cross the floor” we greet you with alacrity. We should welcome all new members with a campaigning records. The rule change on a second deputy leader was withdrawn despite NEC backing. Skwawkbox explains why! Richmond Park, the CLP for Zac Goldsmith’s seat proposed that CLPs should be able to ask the NEC for permission not to stand a candidate. When Goldsmith forced his vanity bye-election, I suspect that the CLP considered not running a candidate and even when they did, the unfortunate Christian Woolmar, received less votes than there are members of the local Party and the LibDem’s Sarah Olney won by 1,872 votes, removing a racist, arch-brexiteer, silver spoon Tory from Parliament although Olney was a flag bearer for the orange book and it must be recognised that joining the coalition led nearly all those supporters of the social democratic tradition not in Parliament to leave. This now makes the LibDems unattractive allies in an anti-tory alliance. As you may know, I am a supporter of Stop the Purge campaign as the rule under which these exclusions have been taken taken offends the principles of natural justice. After the election last year, the CLP Chair, in a speech to the General Committee observed that we had all worked well together during the election and wouldn’t it be great if this could continue. I agreed, and so I wrote the following motion as several people, that I know of, who joined the CLP have been excluded. It calls for the lifting of all exclusion decisions taken under this Rule. The motion was carried at my branch meeting last night. This rule has been used to exclude LP members with no defence, no appeal and no public review of the evidence. Labour’s membership should be open to all who share our values and support Labour’s election campaigns. In the spirit of post-election unity, this branch calls for the reinstatement of automatically excluded members. This meeting instructs the branch secretary to submit this motion to the CLP Secretary for consideration at the next GC . So now it goes to the General Committee. There were two points raised which are interesting and deserve reply. The first is that if we delete the rule, how can we defend ourselves against electoral opponents, The answer to that is simple, there are plenty of other rules that define that offence, but even then such actions should be considered under a process that includes a defence, and right of appeal. I have now spoken to one of the Guildford Three. They were expelled for organising a public meeting to explore a common/shared candidate. The General Committee had voted to explore the possibility of a “Progressive Alliance” candidate. A public meeting was organised, the three Labour organisers were expelled. A candidate was imposed. In response, the General Committee voted a zero budget for the SW Surrey Campaign and donated what they would have spent to their nearest marginal, Ealing Central. Most of SW Surrey CLP’s leadership travelled to support Labour candidates in other seats. Steve Williams, after his expulsion, nominated Louise Irving, the NHAP candidate. As he says, once expelled the rules have no power. The three people expelled are all Corbyn supporters, of course, and leading activists in the CLP. … Those were the bad old days. Under Jeremy’s enlightened leadership the mistakes of the past will not be repeated. 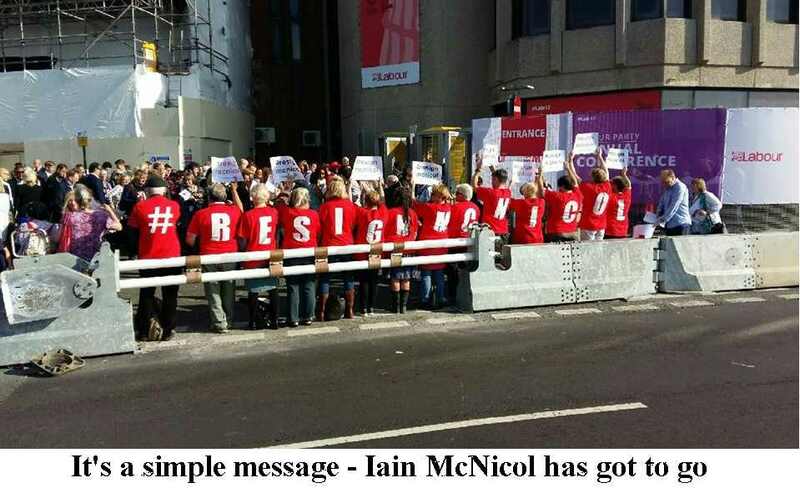 Some comrades, mainly it would seem from Brighton, where suspensions and expulsions are still in place protested about McNicol’s continued employment calling on him to resign. Joanna Baxter, an ex member of the NEC, raised a point of order complaining that it was abusing staff. I went to visit some Labour Party friends in North London last night; several of them have been “auto-excluded” from membership. This has to stop. I have developed a rule change motion [ Download here … ] or http://bit.ly/2sFM6t8. The problem with the rule is in three words, automatically, support and organisation. Automatically denies the accused natural justice, support has no threshold of proof, ( tweets i.e. 128 character phrases have been taken as sufficient) and organisation can be anything, there’s no qualification of opposition or unacceptability. If you agree, it would be good to get this on the Conference Agenda, it needs to be passed at an appropriate CLP meeting and submitted to LP HQ by July 7th. “The Labour Party campaigns in and with communities and their organisations. It also works with other political parties although currently only the Co-op Party. Not all relationships of supporting & joining organisations other than official Labour organisations are prohibited by the rules. Unity in electoral campaigns and compliance with the rules should be the required level of commitment. Registered supporters are asked to agree with the aims of the party and not belong to an organisation opposed to it. This should be the standard for membership. Prohibition of support of organisations other than affiliates creates a chilling effect for joining and support of such organisations. It means working with organisations such as Hope not Hate, Liberty, Green Peace or Amnesty International may render members liable to automatic expulsion. This has been used in a factional manner where long-term members and Green Party converts have been expelled. Disciplinary action taken varies; members of other parties who hold public office wishing to join are usually accepted.